New Caledonia, the foreshortened form of Territory of New Caledonia and Dependencies (French: Nouvelle-Calédonie or Territoire des Nouvelle-Calédonie et Dependances; popular names: Kanaky, Le caillou), is a " sui generis collectivity" (in practice an overseas territory) of France, made up of a main island (Grande Terre) and several smaller islands. It is located in the region of Melanesia in the southwest Pacific. At about half the size of Taiwan, it has a land area of 18,575.5 square kilometres (7,172 sq mi). The population at the 2004 census was 230,789 inhabitants. It has an Internet country code top-level domain ( ccTLD) of .nc. 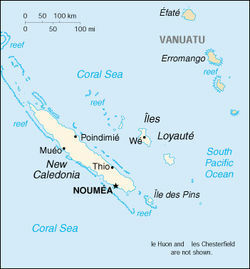 The capital and largest city of the territory is Nouméa. The currency is the CFP franc. Since 1986 the United Nations Committee on Decolonization has included New Caledonia on the United Nations list of Non-Self-Governing Territories. New Caledonia will decide whether to remain within the French Republic or become an independent state in a referendum sometime after 2014. Its capital Nouméa is the seat of the regional organization the Secretariat of the Pacific Community (formerly the South Pacific Commission). The name Caledonia derives from the Latin name of an area corresponding to modern Scotland. The name Kanaky is also in common usage in French, English and the indigenous languages. This name is favored by Melanesian nationalists. The word comes from kanaka, a Polynesian word meaning human used by Polynesians to call themselves. The word was later used by the French to call all the native inhabitants of the South Pacific Ocean, including the Melanesian (non-Polynesian) native inhabitants of New Caledonia. The word, turned into Canaque in French, became derogative. In the 1960s and 1970s, when the Melanesian native inhabitants started to organize themselves into political parties and ask for independence, this derogative word was turned into a symbol of political emancipation and pride. In 1983, during the period of political turmoil, the terms KANAK and KANAKY became political brand names and Caucasians ( Caldoches) realized the name had changed into a political statement. New Caledonia is located around 21°30′S 165°30′E in the southwest Pacific Ocean, approximately 1,200 kilometres (746 mi) east of Australia and 1,500 kilometres (932 mi) northwest of New Zealand. The island nation of Vanuatu lies to the northeast. New Caledonia is made up of a main island, the Grande Terre, and several smaller islands, the Belep archipelago to the north of the Grande Terre, the Loyalty Islands to the east of the Grande Terre, the Île des Pins to the south of the Grande Terre, the Chesterfield Islands and Bellona Reefs further to the west. The Grande Terre is by far the largest of the islands, and the only mountainous island. It has an area of 16,372 square kilometres (6,321 sq mi), and is elongated northwest-southeast, 350 kilometres (217 mi) in length and 50 to 70 kilometres (31–44 mi) wide. A mountain range runs the length of the island, with five peaks over 1,500 meters (4,900 ft). The highest point is Mont Panié at 1,628 meters (5,341 ft) elevation . The total area of New Caledonia is 19,060 square kilometres, 18,575 square kilometres of those being land. New Caledonian soils contain a considerable wealth of industrially-significant elements and minerals, including about one-quarter of the world's nickel resources. Mining is therefore a significant industry that greatly benefits the national economy. However, the country is also home to numerous, critically-important ancient ecosystems. Thus, widely-practiced and indiscriminate open-pit mining across much of New Caledonia, has been (and continues to be) responsible for severe deterioration of the nation's irreplaceable natural heritage. "Baie des Tortues" (Turtles bay) near "La roche percée" (The bored rock) at Bourail in New Caledonia. New Caledonia lies astride the Tropic of Capricorn, between 19° and 23° south latitude. 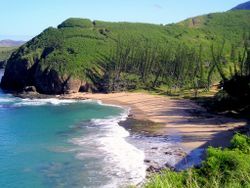 The climate of the islands is tropical, and rainfall is highly seasonal, brought by trade winds that usually come from the east. 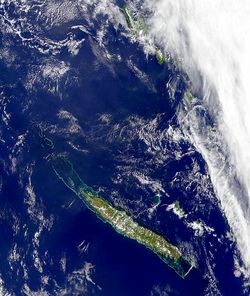 Rainfall averages about 1,500 millimetres (59 in) yearly on the Loyalty Islands, 2,000 millimetres (79 in) at low elevations on eastern the Grande Terre, and 2,000-4,000 millimetres (79–157.5 in) at high elevations on the Grande Terre. The western side of the Grande Terre lies in the rain shadow of the central mountains, and rainfall averages 1,200 millimetres (47 in) per year. New Caledonia is considered one of the world's most botanically-important, and critically endangered hotspots. Unlike many of the Pacific Islands which are of relatively recent volcanic origin, New Caledonia is an ancient fragment of the Gondwana super-continent. New Caledonia and New Zealand separated from Australia 85 million years ago, and from one another 55 million years ago. This isolated New Caledonia from the rest of the world's landmasses, and made it a Noah's Ark of sorts, preserving a snapshot of what the ancient forests of Gondwana looked like, millions of years ago. The country still shelters an extraordinary diversity of unique, endemic, and extremely primitive plants and animals of Gondwanan origin. For more information on the significance of this country's flora and fauna, as well as the dangers it faces, and its effects on national social, economic, and political life, see Biodiversity of New Caledonia and Endemic Birds of New Caledonia. Although the majority of the country's citizens are unaware of the extraordinary nature of their country's biological patrimony, a few of the country's animals and plants have become somewhat emblematic in local culture. Among the best known, is a hen-sized, flightless bird, commonly-known as the Cagou or Kagu, which has a large crest and an odd cooing call. Its song and image are frequently seen as nationally-recognized icons. Another frequently used cultural emblem is the Columnar or Cook's Pine (Araucaria columnaris), an important symbol in Kanak culture. The Niaouli tree (also native to Australia and New Guinea), is of medicinal interest, locally and abroad. Its sap (which contains Gomenol, a camphor-smelling compound), is used to treat head colds, and as an antiseptic. It also shows potential to treat other medical ailments. Before the Europeans arrived, there was no mammal other than the Roussette (aka flying fox), a large vegetarian bat, considered a local delicacy. Less well-known by the local population, is the fact their country is home to a species of plant, ( Amborella trichopoda), believed to be genetically close to the ancestor of all flowering plants, or the fact their nation boasts the largest number and diversity of conifer species in the world, per geographic area (a remarkable fact, given that conifers are usually relatively rare in tropical regions). The islands contain two precipitation zones: Higher-rainfall areas (located on the Loyalty Islands, Isle of Pines (Île des Pins), and on the eastern side of Grand Terre) which support New Caledonia rain forests, and a more arid region, home to the now exceedingly-endangered New Caledonia dry forests, located in the rain shadow on the western side of Grand Terre. Europeans settled on the dry west coast of Grand Terre, leaving the east (as well as the Loyalty Islands and the Isle of Pines) to the Kanaks, and resulting in an ethno-cultural division which coincides with the natural one. Extensive farming by Europeans in the dry forest areas, has caused these forest ecosystems to virtually disappear. It is a vast oversimplification, however, to merely describe New Caledonia's extremely important, complex and diverse ecology in terms of precipitation zones. Species and ecological diversity is further complicated by soil type (degree and type of mineralization), altitude, and geographic location (for instance, Loyalty Islands and Isle of Pines have flora that is distinct from Grand Terre). In addition to the remarkable terrestrial environment of New Caledonia, the country is also home to important aquatic ecosystems. Its freshwater ecology also evolved in long isolation, and the New Caledonia rivers and streams are home to many endemic species. Moreover, the New Caledonia Barrier Reef, which surrounds Grande Terre and the Isle of Pines (Île des Pins), is the second-largest coral reef in the world after Australia's Great Barrier Reef, reaching a length of 1,500 kilometres (930 mi). Like its terrestrial counterpart, the Caledonian reef system has great species diversity, is home to endangered dugongs (Dugong dugon), and is an important nesting site for the Green Sea Turtle (Chelonia mydas). The Nautilus is a living-fossil species, once common during the age of the dinosaurs, and survives today in the waters surrounding New Caledonia. Along with other Pacific Ocean's territories of French Polynesia and Wallis and Futuna, New Caledonia is part of the French Republic. Its official status, unique in the French Republic, is said to be sui generis, because New Caledonia is the only French subdivision that is not a collectivité territoriale. New Caledonia was a colony until 1946, then an overseas territory ( territoire d'outre-mer, or TOM) from 1946 to 1999. The capital is Nouméa, the only major conurbation in the territory. Administratively, the archipelago is divided into three provinces: Islands Province (Province des Îles = Loyalty Islands), North Province (Province Nord = the northern mainland) and South Province (Province Sud = the southern mainland). It is further subdivided into thirty-three communes. In addition, a parallel layer of administration exists for Kanak tribal affairs; these are called aires coutumières ("traditional spheres") and are eight in number ( see map of the "aires coutumières"). Their jurisdiction does not encompass non-Kanaks living within these zones. The aires coutumières more or less correspond to the indigenous language areas and/or areas of pre-French tribal alliances. The western Pacific was first populated about 50,000 years ago. The Austronesians moved into the area later. The diverse group of people that settled over the Melanesian archipelagos are known as the Lapita. They arrived in the archipelago now commonly known as New Caledonia and the Loyalty Islands around 1500 BC. The Lapita were highly skilled navigators and agriculturists with influence over a large area of the Pacific. Europeans first sighted New Caledonia and the Loyalty Islands in the late 18th century. The British explorer James Cook sighted Grande Terre in 1774 and named it New Caledonia. Caledonia being the Latin name for Scotland. During the same voyage he also named the islands to the North of New Caledonia the New Hebrides. British and North American whalers and sandalwood traders became interested in New Caledonia and tensions developed as their approach became increasingly dishonest (an arrogant attitude and cheating became commonplace). Europeans used alcohol and tobacco amongst other things to barter for commodities. Contact with Europeans brought new diseases such as smallpox, measles, dysentery, influenza, syphilis and leprosy. Many people died as a result of these diseases. Tensions developed into hostilities and in 1849 the crew of the Cutter were killed and eaten by the Pouma clan. As trade in sandalwood declined it was replaced by a new form of trade. Blackbirding involved enslaving people from New Caledonia, the Loyalty Islands, Vanuatu, Papua New Guinea and the Solomon Islands to work in sugar cane plantations in Fiji and Queensland. The trade ceased at the start of the 20th century. Catholic and Protestant missionaries first arrived in the nineteenth century. They had a profound effect on indigenous culture. They insisted people should wear clothes to cover themselves. They eradicated many local practices and traditions. The island was made a French possession in 1853 in an attempt by Napoleon III to rival the British colonies in Australia and New Zealand. Following the example set by the British in nearby Australia, between 1854 and 1922 France sent a total of 22,000 convicted felons to penal colonies along the south-west coast of the island; this number includes regular criminals as well as political prisoners such as Parisian socialists and Kabyle nationalists. Towards the end of the penal colony era, free European settlers (including former convicts) and Asian contract workers by far out-numbered the population of forced workers. The indigenous Kanak populations declined drastically in that same period due to introduced diseases and an apartheid-like system called Code de l'Indigénat which imposed severe restrictions on their livelihood, freedom of movement and land ownership. New Caledonia has been on a United Nations list of non-self-governing territories since 1986. This list includes such places as the American Samoa, the British Falkland Islands or the New Zealand territory of Tokelau, but noticeably it does not include places like Tibet or West Papua, which has led to its reputation as a politically biased list. Agitation by the Front de Libération Nationale Kanak Socialiste ( FLNKS) for independence began in 1985. The FLNKS (led by the late Jean-Marie Tjibaou, assassinated in 1989) advocated the creation of an independent state of 'Kanaky'. The troubles culminated in 1988 with a bloody hostage taking in Ouvéa. The unrest led to agreement on increased autonomy in the Matignon Accords of 1988 and the Nouméa Accord of 1998. This Accord describes the devolution process as "irreversible" and also provides for a local Caledonian citizenship, separate official symbols of Caledonian identity (such as a "national" flag), as well as mandating a referendum on the contentious issue of independence from the French Republic sometime after 2014. Flag of the independence movements. The unique status of New Caledonia is in between that of an independent country and a normal overseas département of France. On the one hand, a territorial Congress ( Congrès du territoire) and a government of the territory have been established, and a devolution of powers is organized by the 1998 Nouméa Accord. Key areas such as taxation, labour law, health and hygiene and foreign trade are already in the hands of the territorial Congress. Further competence will supposedly be given to the territorial Congress in the near future. Eventually, the French Republic should only remain competent for foreign affairs, justice, defense, public order, and treasury. A New Caledonian "citizenship" has also been introduced: only New Caledonian "citizens" have the right to vote in the local elections. This measure has been criticised, because it creates a second-class status for French citizens living in New Caledonia who do not possess New Caledonian "citizenship" (because they settled in the territory recently). New Caledonia is also allowed to engage in international cooperation with independent countries of the Pacific Ocean. Finally, the territorial Congress is allowed to pass statutes that are derogatory to French law in a certain number of areas. On the other hand, New Caledonia remains a part of the French Republic but not perhaps an integral part. The four departments d'outremer proper of Reunion, Guadeloupe, Martinique and French Guyana all use the euro as their sole official currency but New Caledonia does not. The Inhabitants of New Caledonia are French citizens and carry French passports. They take part in the legislative and presidential French elections. New Caledonia sends two representatives to the French National Assembly and one senator to the French Senate. The representative of the French central state in New Caledonia is the High Commissioner of the Republic ( Haut-Commissaire de la République, locally known as "haussaire"), who is the head of civil services, and who seats in the government of the territory. It was decided in the Nouméa Accord that the territorial Congress will have the right to call for a referendum on independence after 2014, at a time of its choosing. The current president of the government elected by the territorial Congress is Marie-Noëlle Thémereau, from the loyalist (i.e. anti-independence) Avenir Ensemble party ("Future Together"), which toppled the long-time ruling RPCR ( Rally for Caledonia inside the Republic) in May 2004. "Future Together" is a party of mostly Caucasian and Polynesian New Caledonians opposed to independence but tired of the hegemonic and allegedly corrupt anti-independence RPCR. Their toppling of the RPCR (that was until then seen as the only voice of New Caledonian whites) was a surprise to many, and a sign that the society of New Caledonia is undergoing changes. "Future Together", as the name implies, is opposed to a racial vision of New Caledonian society, opposing Melanesian native inhabitants and the descendants of European settlers, and is in favour of a multicultural New Caledonia, better reflecting the existence of large populations of Polynesians, Indonesians, Chinese, and other immigrants. Some members of "Future Together" are even in favour of independence, though not necessarily on the same basis as the Melanesian independence parties. Though still the largest group, the indigenous Melanesian Kanak community now represents 42.5% of the whole population, their proportion of the population having declined due to immigration and other factors. The rest of the population is made up of ethnic groups that arrived in New Caledonia in the last 150 years: Europeans (37.1%) (the majority French with German, British and Italian minorities), Polynesians (Wallisians, Tahitians) (11.8%), Indonesians (2.6%), Vietnamese (1.4%), Ni-Vanuatu (1.2%), and various other groups (3.9%), such as Malabaris and Tamils, Indians (Hindu and Muslim), Sri Lankans, Bengalis, Berbers, Japanese, Chinese, Fijians (Native Fijians and Fiji Indians), Arabs, West Indian (mostly from other French territories) and a small number of ethnic Africans. Some of this immigration was a direct consequence of various conflicts around the world but in particular of the crumbling of the French colonial empire. The Kanak are known officially as Melanesians. Similarly, those whose roots are in French Polynesia are known either as Tahitians (which excludes persons originating in the other archipelagoes of French Polynesia) or simply as Polynesians (which would include both Tahitians and Wallisians, as well as many other minor groups). Whites that have lived in New Caledonia for several generations are locally known as Caldoches, whereas newcomers who have immigrated from metropolitan France are called Métros or Métropolitains. Within the official statistical category "Europeans" no distinction is made between Caledonian-born whites and French-born whites, however it is estimated that approximately two thirds identify themselves with the Caldoche community while the rest see themselves primarily as French immigrants. There is a significant contingent of people that arrive from France to work for a year or two and others that have come to retire. The Caldoche usually refer to themselves simply as calédoniens and may be either white (mostly French or German) or white with an admixture of Asian, Melanesian or Polynesian ancestry. Caldoche culture has many similarities with Australian and Afrikaner culture. Until very recently the Kanak population held an economically disadvantaged position in New Caledonian society, while wealthy French expatriates formed the top of the socio-economic hierarchy. The Asian and Polynesian inhabitants dominate certain segments of the local economy. There have been frequent accusations by the pro-independence movement that the French government is attempting to skew the demographic balance between the ethnic communities by clandestinely settling thousands of people from mainland France among the white Caledonians. Censuses are extremely critical to the balance of power in New Caledonia, and the organisation of a new census was regularly postponed after 1996. Eventually the census was carried out in August and September 2004, amidst raging controversies over ethnic questions. Due to an intervention by French president Jacques Chirac, questions asking for the ethnicity of people were deleted from the 2004 census, officially because they were deemed to contravene the French Constitution, which states that no distinction based on ethnicity or religion should be made among French citizens. The indigenous Melanesian Kanak leaders, who are extremely sensitive to ethnic balance issues, called for New Caledonians of Kanak ethnicity not to return census forms if questions regarding ethnicity were not asked, threatening to derail the census process. Eventually, the stalemate was resolved when the local New Caledonian statistical office (a branch of the national French statistical office INSEE) agreed to ask questions regarding ethnicity. However, it is not known whether questions regarding ethnicity were asked to all residents of New Caledonia, and at any rate no data have been released, leaving the ethnic tables from the 1996 census as the only information on ethnicity currently available. According to the 2006 census, there were 219 246 inhabitants in New Caledonia as of July 2006. Kanak leaders were fearful of a large influx of white people from metropolitan France which would alter the ethnic balance in the territory but this has not happened.